We’re pleased to report that Kitplanes magazine has published a comprehensive listing of Super Cub kits. This cover story is contained in the March 2012 issue of Kitplanes and prominently features the Super 18 (helloooooo, cover girl!). We were happy to talk with author Dave Prizio about the Super 18 but wanted to clarify and expand upon a few parts of his otherwise very informative and well-written article. On page 13 of the article, in regards to kit completion costs, Dakota Cub Director of Marketing Amy Gesch is quoted as giving an estimated completion cost of $98,400 for a kit “with a used engine, no radios, and no paint.” The cost we list on our price lists uses estimates for a used, mid-time engine, prop, covering materials (fabric, primer, paint), instrumentation, wheels, brakes, and tires. The estimated $98,400 DOES include paint; however, it should be noted that these are estimated materials costs. Vendor pricing may change without notice, and builders should also note that these costs do not take into consideration any labor costs (if the builder decides to seek partial assistance). We seek to provide builders with our best judgment of what they can expect to invest in their airplane. The experimental market is beautiful because of the wide variety of kits and options available for them, but it can make estimating costs potentially difficult. For this reason, we have chosen to give basic estimates. It is possible to build a Super 18 at the numbers we have stated, but more likely that the builder will find different options to incorporate that could affect the final cost (this is true of any kit). On page 14, the article states “Dakota Cub has two models of its Super 18.” For the purposes of this article, this is true because the article focused on non-LSA aircraft and discusses the Super 18-160 and -180. However, we do offer (as mentioned on page 15) a third kit, the Super 18 LT. The S18-LT can be built as an LSA with a gross weight of 1,320 lbs or up to 1,600 lbs for pilots seeking more utility. On page 15, the picture of the AOSS on a Super 18 mentions in the caption that “AOSS is an option” on Super 18s. While the AOSS is standard equipment on the certified Super 18, builders are free to explore different suspension options such as bungees or hydrasorbs. We recommend the AOSS because we feel it is a great solution for all uses, but can assist builders in procuring any system. We do want our builders to know that we can help them source many other components, including engine and prop. We do not include them in the basic kits in recognition of the many different choices, but also wish to make the building process as simple as possible. Please let us know if there is anything we can help with and we’ll be happy to assist. The table on page 18 gives a great at-a-glance comparison of different kit options. Unfortunately, our empty weight and gross weight numbers accidentally got switched. To clear any confusion, the empty weight of the Super 18-160 is 1,150 lbs and the gross weight is 2,050 lbs. The empty weight of the Super 18-180 is 1,250 lbs and the gross weight is 2,300 lbs. Additionally, 23-gallon fuel tanks are standard equipment for both the -160 and -180 kits, for a total of 46 gallons of fuel. The table states that 18-gallon tanks are standard; this is incorrect. We can furnish 18-gallon tanks to builders who prefer the smaller tanks, but this is not a common request. Remember that it is possible to use different engines on all kits. We have named them in accordance with what we believe is a good match, but builders are free to pursue different options (there’s no such thing as too much horsepower). You can put an O-360 (180 hp) on a Super 18-160, or use modified engines like the O-375, etc. We must also mention that we have tested our kit components more thoroughly than any competitor because our kits are comprised of certified parts. This means every part we supply to you, with the exception of raw material for builder-produced items (such as the material for the builder-made boot cowl), has either a PMA (Parts Manufacturing Approval) or a type design approval through our type certificate. What does this mean to you? It means the airplane will do what we say it will do and won’t let you down. Our numbers are backed up by extensive testing, not best guesses. As we like to say: No games–honest performance. We invite you to come visit us at Sun ‘n’ Fun, Oshkosh, or at our facility in South Dakota, to learn more and come for a demo ride. Hey, we’re looking for an excuse to go flying as much as you are! The March 2012 issue of Kitplanes is available online to subscribers and should be in the mail. Non-subscribers can find Kitplanes at a local bookstore like Barnes and Noble (expected to be available beginning February 15-20, depending upon store location). 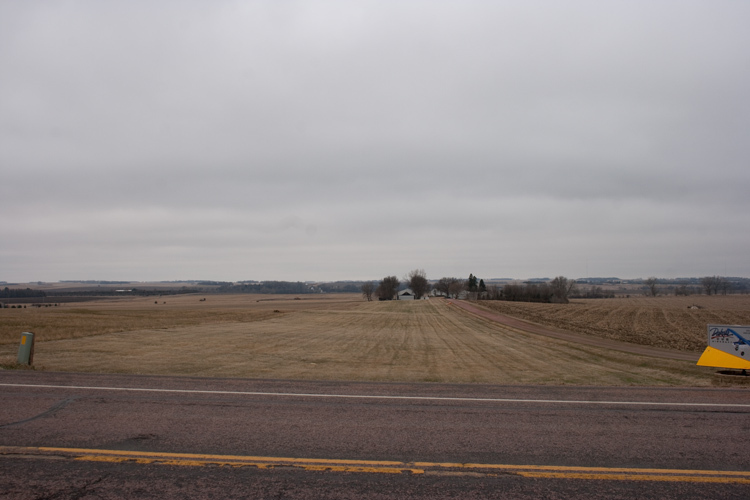 No snow, no go: we’re sorry to report that we will be unable to send a Super 18 to the EAA Skiplane fly-in this year. The problem? We have no snow! While Wisconsin received some snow over the past week, we here in South Dakota (and our easterly neighbors in Minnesota) have not received enough for ski installation. Additionally, the forecast for the skiplane fly-in weekend is calling for temperatures up to 50 degrees! Brr. Looks cold. We may even open the door up at 50 degrees! Christmas might be over but the DCA elves have already been scheming up new fun for the new year. We’re pleased to announce that our open house is scheduled for Saturday, June 2nd. We elected to move the open house to the weekend before the Missouri Breaks fly-in to allow more local pilots and aircraft to attend. If you are heading to the Breaks or Johnson Creek, we still extend our offer to stop in and spend the night here on your way westward. Please be advised there are two large towers (2o00′ AGL) to the southwest. 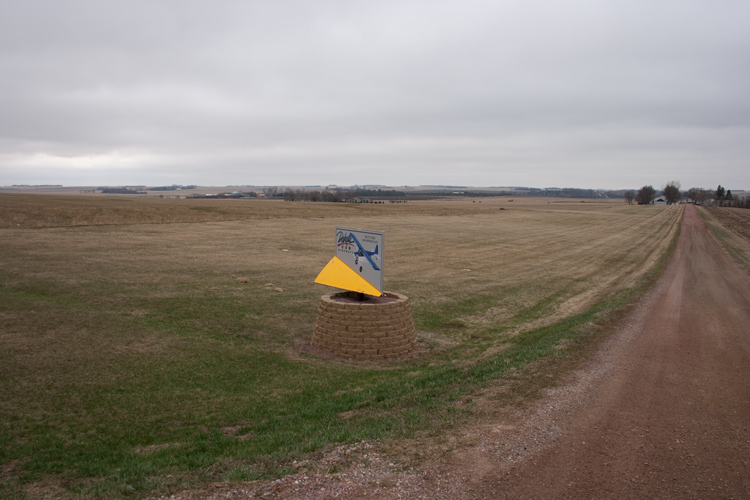 Additionally, Sioux Falls Class D airspace is not too far to the west, but we are located east of Brandon, SD, and if you stay east of Brandon you will be outside FSD’s airspace. This is an OFF-AIRPORT event. DCA HQ is not an official airport and we make no claims as to conditions of the runway. 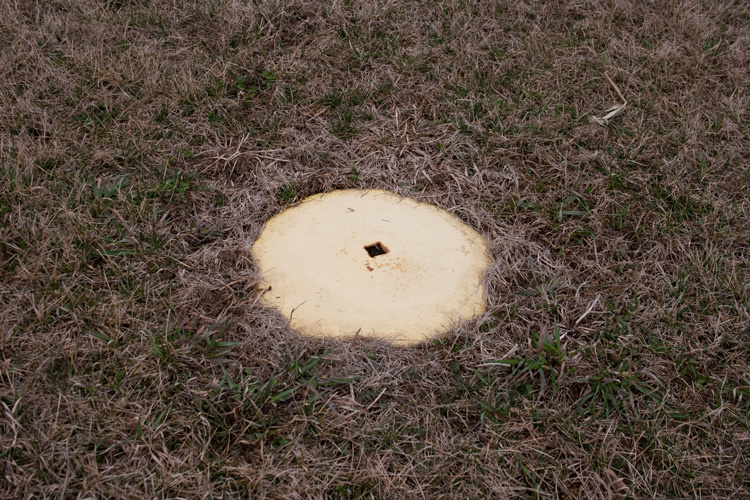 The terrain is very mildly rolling and pretty sedate, but land AT YOUR OWN RISK. Dakota Cub is not liable for damages that occur as a result of attending the open house–and your landing on our runway constitutes acceptance of these terms. We are a pretty laid-back group and like to have fun, safely. Again, we work to be good neighbors and to be considerate of those around us. Please keep that in mind with your arrival procedures and fun flying. South-facing view of DCA runway. Note tetrahedron on the right and electrical box on the left and road. 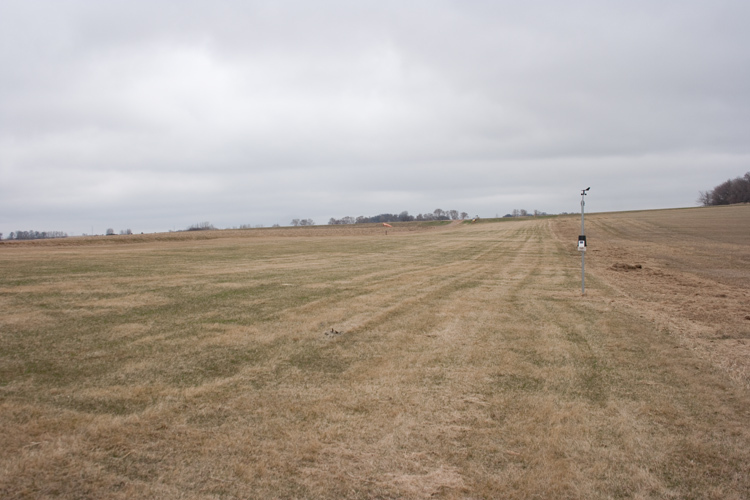 These are placed on either side of the runway every 100 feet to make grading short takeoffs and landings easy! Bring tie-downs for your aircraft and a tent if you are staying overnight. We have a shower available and some inside space where we can probably cram a few people (shop floors likely open in event of downpour). We have room for 20-25 airplanes so invite your friends! 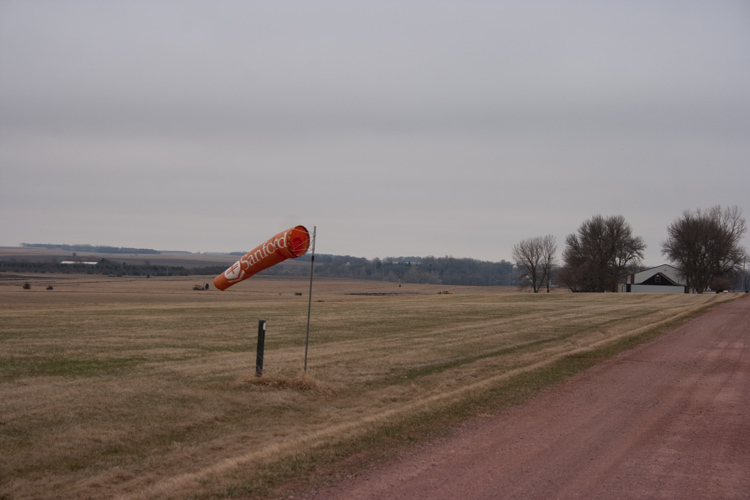 Fuel is available at Luverne, MN (KLYV) and Sioux Falls, SD (KFSD) and several other nearby airports. KLYV typically has the best prices. Food’s on us–but we appreciate grill help! Please RSVP using the poll or email Amy at algesch AT dakotacub.com and let us know how many of you are coming! P.S. 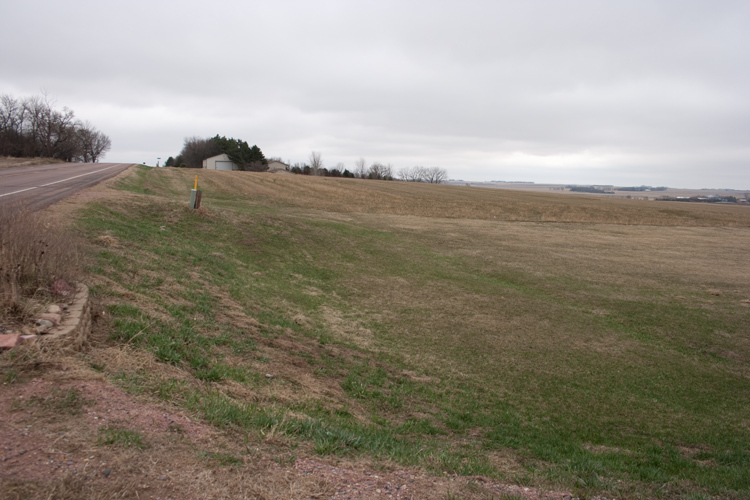 We promise it will be greener by June! Merry Christmas and Happy New Year to all our of aviation family! Here's hoping Rudolph finds you! We’re excited to announce we just received our forum schedule for Sun ‘n’ Fun 2012! As the days get shorter and colder, we look forward to sunny Florida (hopefully sans tornados this year). Hope to see you there! We get a lot of questions regarding the owner-produced parts rule. What does it mean? What does it cover? When can I use it, and when can’t I? What if I don’t have the experience or equipment to produce a part no longer manufactured? All of these questions and more will be addressed in our forum. While we will focus on Cub parts, the scope of the owner-produced parts is valuable information to owners of any vintage aircraft. Building an airplane is a great way to fulfill all your airplane wishes, from instrument layout to engine choice and paint. Kit aircraft provide an organized way to build your dream airplane to help ensure your success. How do you choose the right kit for you? What are things you should consider in choosing? What are the differences between the Super 18 kits and other Cub-alike kits? What if I can’t choose and want all 3 Super 18 models?? We can handle all those questions and hope we can help get you on the road to building your perfect airplane. 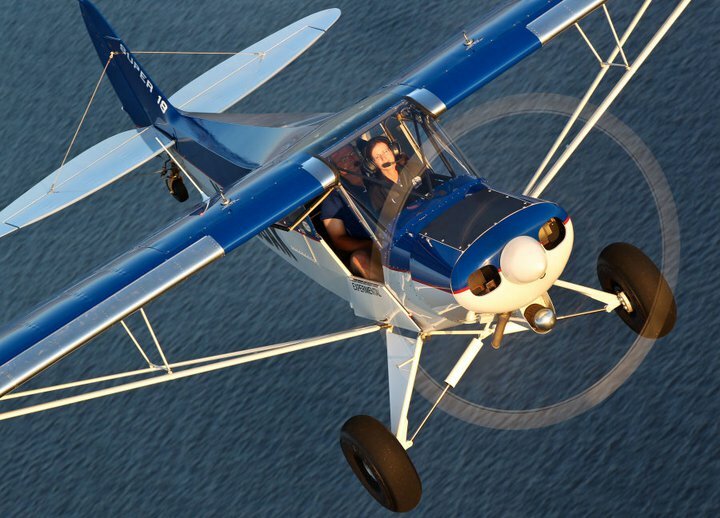 Back by popular demand, this forum will further explore the Light Sport Aircraft-eligible Super 18 LT. LSA-specific concerns will be addressed. Other critical information, such as builder tasks and performance, will be key topics. If you are considering the LSA route but are concerned you can’t have a “real” airplane designed to hold up to years of use and abuse, this forum is a must. Let us show you the perfect way to enjoy LSA privileges without sacrificing utility! You can now view our EAA webinar online! If you have any questions, feel free to give us a call at (605) 757-6628 or email Amy at algesch (at) dakotacub.com. We do firmly believe that the only time you have too much gas is when you’re on fire (or when that 42-oz gas station special that looked so appealing before departure turns out to not be such a good idea). This is especially important for the members of our customer family that operate in remote areas where gas stops are few and far in-between, and prone to extended outages to boot. So what’s a Cub driver to do? Install Dakota Cub extended-range fuel tanks, of course. We developed these tanks to Part 23 standards for our certified Super 18-180, which means these tanks meet the latest regulations for construction. They are better reinforced than original tanks or other aftermarket tanks due to these stringent requirements, which means they are much more leak-resistant, especially over the life of a working airplane. Our extended range tanks have a 23-gallon capacity which equates to a solid hour of extra flying for most applications (ex., standard PA-18 tanks=18 gallons, standard PA-12 tanks=19 gallons). They can be installed without recovering the wing for retrofit installations and require peeling back the fabric; however, they are easiest to install when performing a full restoration with uncovered wings. We also produce tank lids for continued easy access for inspection. 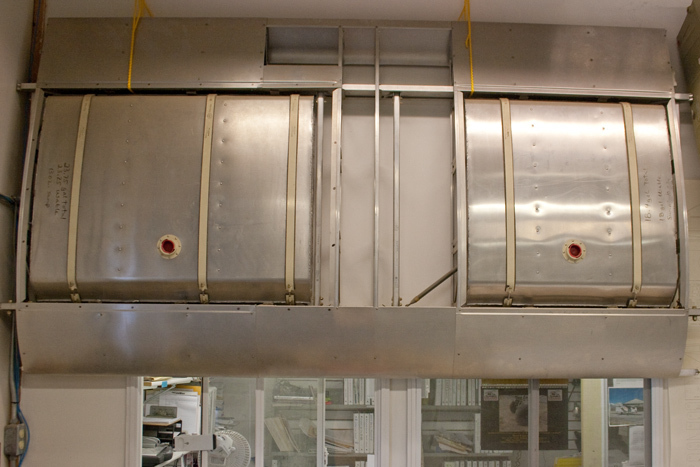 Our tanks are installed with tank straps to keep them secure and minimize the flexion forces affecting them. By suspending them in straps, we decrease the wear and tear that makes other non-strapped tanks prone to leakage. Because really, who wants to deal with a fuel leak trapped inside a wing with no tank lid? Quite frankly, that’s the stuff that haunts our nightmares because it means more time spent on the ground chasing squawks that keep us from flying! 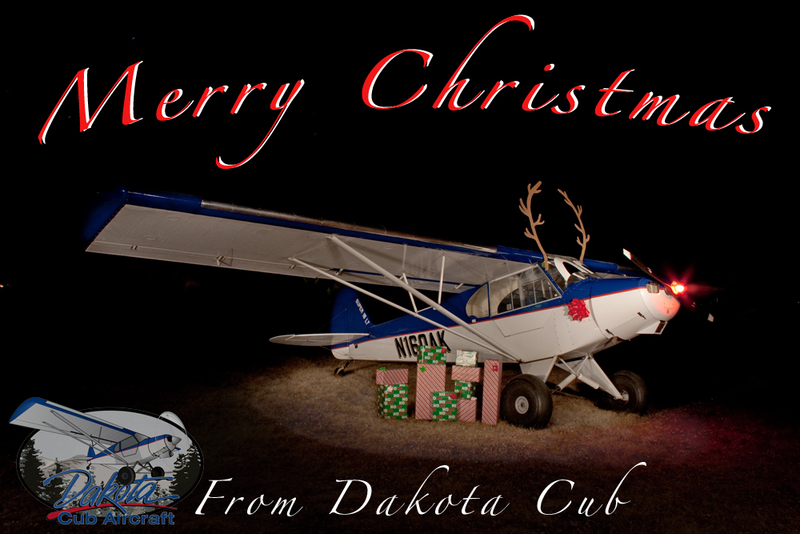 For more information, contact us at info@dakotacub.com or give us a call at (605) 757-6628! We are pleased to report that N230AK, our Super 18-160 demonstrator, is featured in EAA Chief Photographer Jim Koepnick’s Top 20 Photos of AirVenture 2011. We were honored to have flown a photo mission with Jim, along with EAA Staff Photographer Steve Cukierski and photo plane pilot Bruce Moore, a mix of names equivalent to aviation photography royalty. Note: This gallery is hosted on Facebook but does not require a Facebook account. It has not been added to the photo gallery list on http://www.airventure.org yet. Chris comes to the Dakota Cub team fresh from the University of Minnesota–Twin Cities trained in aerospace engineering. He graduated in May of 2011 and started with us in June after getting settled here in South Dakota. Chris hails from Two Rivers, WI, which is approximately 10 minutes northeast of Manitowoc, WI. Sports, including football, baseball, and track, are Chris’ primary hobbies (he played for the U of M Gophers football team as a corner). He enjoys sesame chicken and the TV show Scrubs. Chris applied to Dakota Cub on a whim, seeing a job posting online. 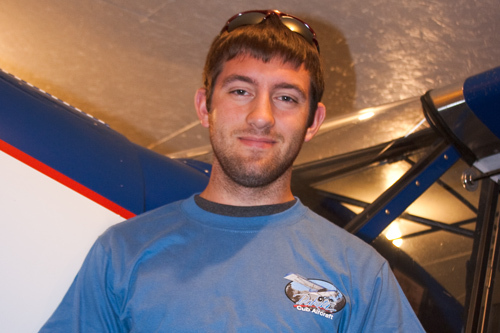 He first became interested in aviation when he visited a local airshow in 6th grade and decided to pursue engineering. He is looking forward to continuing to gain practical experience here at DCA and learning more about the world we operate in. Chris has had an intro flight in our Super 18 LT and is excited to eventually work towards his pilot’s license. We are happy to have Chris on board and hope that you will welcome him when you see him with us next! We have forgotten to mention, DCA team member Amy will be stealing away in our Super 18 LT to fly to Lock Haven, PA, for the Sentimental Journey fly-in. She will be departing sometime on Saturday, June 18th and making a few stops along the way. While this is not an official DCA trip, she will be bringing along a few samples and has “prodigious amounts of baggage space” which she can store parts deliveries in depending upon size. Good candidates for Super 18 delivery include gascolators, fuel selector valves, fuel sight gauges, and other similarly sized items. Single ribs may be a possibility but rib sets won’t work (Amy does pack like a girl, after all). Ailerons and flaps won’t fit due to all the other “stuff” Amy will end up bringing (who needs a towel, anyways??). Bottom line: We’ll do our best to fit it in no matter what it is! However, we make no guarantees. We’ll let you know Saturday if your parts won’t fit but we’ll have a pretty good idea if it will when you order it. If you would like to take us up on this offer of free air freight (although it’s definitely not next-day air freight), give us a call at (605) 757-6628 or send Amy an email at algesch AT dakotacub.com!